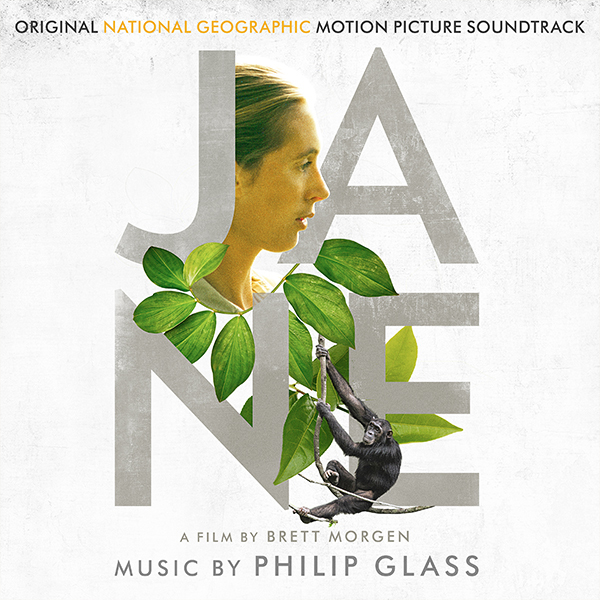 Sony Classical proudly announces the release of JANE (Original Motion Picture Soundtrack) with a new score of Grammy® and Academy Award ®-nominated composer Philip Glass. The soundtrack will be released digitally on September 29th and on CD on October 6th. Drawing from over 100 hours of never-before-seen footage that has been tucked away in the National Geographic archives for over 50 years, Academy award nominated director Brett Morgen (Kurt Cobain: Montage of Heck) tells the story of JANE, a woman whose chimpanzee research challenged the male-dominated scientific consensus of her time and revolutionized our understanding of the natural world. Set to a rich orchestral score from legendary composer Philip Glass, the film offers an unprecedented, intimate portrait of Jane Goodall — a trailblazer who defied the odds to become one of the world’s most admired conservationists. The film, which is distributed by National Geographic Documentary Films, is an official selection of the Toronto International Film Festival, New York Film Festival, and London Film Festival, among many others and will be released in select theaters starting October 20 in New York and Los Angeles. The avant-garde composer and three-time Oscar® nominee is renowned for his concert works, operas such as “Einstein on the Beach,” and scores for dozens of films, including “Koyaanisqatsi,” “The Hours” and “Notes on a Scandal.” When Morgen showed him a rough cut of the material, Glass was immediately hooked. "I was really impressed with the quality of filmmaking in terms of the actual cinematography, which was stunning,” Glass says. “It was at such a high level technically; it seemed like it had been filmed yesterday. ABOUT THE COMPOSER: Through his operas, his symphonies, his compositions for his own ensemble, and his wide-ranging collaborations with artists ranging from Twyla Tharp to Allen Ginsberg, Woody Allen to David Bowie, Philip Glass has had an extraordinary and unprecedented impact upon the musical and intellectual life of his times. The operas Einstein on the Beach, Satyagraha, Akhnaten, and The Voyage, among many others, play throughout the world’s leading houses, and rarely to an empty seat. Glass has written music for experimental theater and for Academy Award®-winning motion pictures such as The Hours and Martin Scorsese’s Kundun, while Koyaanisqatsi, his initial filmic landscape with Godfrey Reggio and the Philip Glass Ensemble, may be the most radical and influential mating of sound and vision since Fantasia. His associations, personal and professional, with leading rock, pop and world music artists date back to the 1960s, including the beginning of his collaborative relationship with artist Robert Wilson. Indeed, Glass is the first composer to win a wide, multi-generational audience in the opera house, the concert hall, the dance world, in film and in popular music simultaneously. He was born in 1937 and grew up in Baltimore. He studied at the University of Chicago, the Juilliard School and in Aspen with Darius Milhaud. Finding himself dissatisfied with much of what then passed for modern music, he moved to Europe, where he studied with the legendary pedagogue Nadia Boulanger (who also taught Aaron Copland, Virgil Thomson and Quincy Jones) and worked closely with the sitar virtuoso and composer Ravi Shankar. He returned to New York in 1967 and formed the Philip Glass Ensemble - seven musicians playing keyboards and a variety of woodwinds, amplified and fed through a mixer. The new musical style that Glass was evolving was eventually dubbed minimalism. Glass himself never liked the term and preferred to speak of himself as a composer of music with repetitive structures. Much of his early work was based on the extended reiteration of brief, elegant melodic fragments that wove in and out of an aural tapestry. Or, to put it another way, it immersed a listener in a sort of sonic weather that twists, turns, surrounds and develops. There has been nothing minimalist about his output. In the past 25 years, Glass has composed more than twenty-five operas, large and small; eleven symphonies (with others already on the way); three piano concertos and concertos for violin, piano, timpani, and saxophone quartet and orchestra; soundtracks to films ranging from new scores for the stylized classics of Jean Cocteau to Errol Morris’s documentary about former defense secretary Robert McNamara; string quartets; a growing body of work for solo piano and organ. He has collaborated with Paul Simon, Linda Ronstadt, Yo-Yo Ma, and Doris Lessing, among many others. He presents lectures, workshops, and solo keyboard performances around the world, and continues to appear regularly with the Philip Glass Ensemble. Philip Glass recorded a new score especially for JANE.